Hedgehogs have long spines. They are related to moles and shrews, over 100 million years primitive and like to dine between 1:00 or 2:00 a.m. And they snuffle. Gary Snyder and his wife awoke hearing grunting, pig-like noises. They investigated and discovered two hedgehogs, well, courting. It fascinated Gary Snyder so much that he went outside, but the noisy things rolled up into two spiky balls. He was able to pick them up carefully; pleasant surprise, they were not afraid of humans. Hedgehogs are nocturnal animals, but they actually see quite poorly at night. Instead, they use whiskers to feel around and rely on their long snouts to sniff out prey. Their sharp spines help hedgehogs feel safe and at home in the dark. There are 15 kinds of hedgehogs around the world, but they are primarily found in Europe, Australia, Asia and Africa. Snyder took to them and decided to do his own research. He found out they know every inch of their territory, having patrolled it since their youth as little independent hoglets. They travel long distances from their safe places like under logs, leaf-litter and among rocks or burrows, where they can sometimes be seen throwing earth behind them in a frenzy with strong claws and hind limbs. With luck, these insectivores live to 12 years, but Snyder found out they were not surviving very well. Their chief enemies were not particularly natural predators, but they had a hard time getting through housing developments because of fences. They were detoured into the street or caught up in fence materials. They also resorted to using the road because the surface had been warmed from the sun during the day, making it more pleasant for them to travel their many miles. The problem was that rolling into a ball didn’t provide any defense against a moving truck. Besides the dangers of vehicular traffic and backyard fences, they were being trapped in McDonalds’ McFlurry cups! Since they always enter and leave their burrows head first, they must always turn around inside. With the drink cups, the carton had an opening at the top and while the hedgehog navigated in to lick up any leftover ice cream, their thick coats of brown or black spines meant they were lodged inside headfirst, and could not back out. They were dying in the cups. Hugh Warwick, an ecologist who works with The Hedgehog Preservation Society, estimates that the number of hedgehogs in Britain has dropped by 30 percent in the past 10 years. Snyder decided to help save hedgehogs by making a small hole in his fence for the foragers to pass through—and he convinced his neighbors to do likewise. They formed an alliance called Hedgehog Street, where people could register and become part of the Hedgehog Highway. They made a website too, and put a map there and created a place to join the people’s trust for the endangered species, log their hedgehog sitings and share photos or other news. After a time, McDonald’s finally agreed to redesign their ice cream containers with a smaller opening, so the hedgehogs couldn’t get their heads in there in the first place. 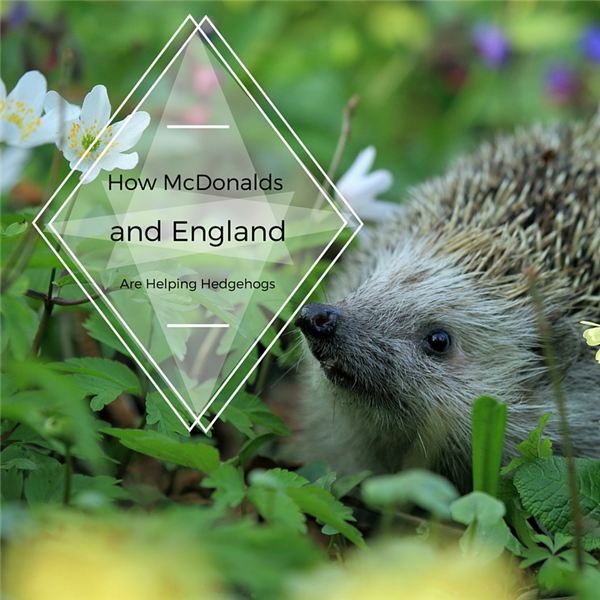 Fay Vass, chief executive of The British Hedgehog Preservation Society said, “We have been in touch with McDonald’s about this problem for over five years and are delighted that they have at last solved the problem." The Egyptians left records of hedgehog pet ownership in hieroglyphic writings. Phoenicians liked them as pets, too. They can be charming, docile and affectionate. Only the African pygmy hedgehog can be legally kept in most European countries as the other species are legally protected. Since they can’t be imported, you have to look to one of the American breeders that number about 2,000. Hedgehogs pretty much munch on anything such as bird eggs, nuts, berries, spiders, bees, snakes, snails, caterpillars, rodents and carrion. Tame ones eat apples and other fruit. Despite being little guys—less than 12-inches long (30 centimeters)—they consume their own weight in food for energy because they are quite active. Vriends, Mathew M., Ph.D. and Tanya M. Heming-Vriends. Hedgehogs: Everything about Housing, Care, Nutrition, Breeding, and Health Care. Hauppauge, NY: Barron’s Educational Series, Inc., 2000. Dunn, Mary R. Hedgehogs: Nocturnal Animals. Mankato, MN: Pebble Plus Capstone Press, 2011. “British Homeowners Build a New Superhighway—for Hedgehogs.” NPR.org., January 26, 2016. 8 A.M.